I begin where I always begin – in my Immaculate Heart. This is the heavenly Father’s secret, his plan for the salvation of the world. He has placed his Son in my heart. His Holy Spirit has come to abide in my heart. These are the secrets that I am trying to reveal so all might know of this treasury. Some misinterpret this doctrine. They think I am speaking of my own powers and my own prerogatives. Rather, I am speaking of God’s powers and where to find them. Am I not the Mother of God? Did not Jesus, true God and Lord of all, dwell in me? Did not the Holy Spirit overshadow me? These are the realities that I speak about when I proclaim the importance of my Immaculate Heart. “He who is mighty has done great things in me”. I am revealing what God has done by his own free decision. Just as he decided to abide in the human nature of Jesus, so he has decided to make my Immaculate Heart a place of his abiding and a place where all can find him. People search for Jesus. They look, but so many times they do not find. He is in my heart. He abides there. He dwells there. 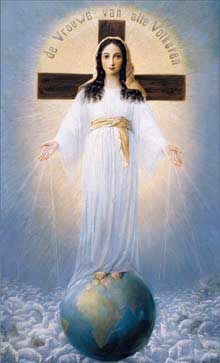 For this reason, the Father wants all the world to honor my Immaculate Heart. This is the easiest place to find his Son, Jesus. He came the first time through me and he will come the second time through me. If a king is coming by a certain road, cannot the citizens go out to meet him? Surely, they can stay home. Yes, the king will certainly come. Yet, the wise citizens say, “We need not wait. We can go out to meet the king”. They only need to know the road that he will use to come to their city. Everyone knows the road that Jesus used to come the first time. This is without dispute. My revelation is so simple, “The road he used the first time, he will use the second time” and those who understand it can go out to meet him. They can find him before the others, who have no interest in meeting the king or do not know which road he will use. Now you see the importance of these revelations of my Immaculate Heart. The king is coming and you can be the first to greet him. The nations go their own way, following the path of self-interest, opening their hearts only when they see their own advantage. They call this the international community, but it is no community at all because it has no king, no leader, no one with a vision which could invite them to higher goals. Each nation strengthens its military, some for aggressive purposes and others for self defense. What is the problem? Why is the world being ripped apart? The nations, even the Christian nations, have set aside my Son. He is the King and Lord of all the nations. Someday, he will return in glory and will gather the nations before him. All will give an account. All the presidents, all the prime ministers, all the kings, all the senators, all the dictators, all the rich and all the powerful will all be stripped of their authority. They will bow down before the King of Kings and they will give an accounting of their stewardship. They will see their foolish pride and their wisdom will be revealed as foolishness. Their crimes will be exposed and their hidden deeds brought to light. Why do I say this? I want to speak to world leaders on every level. If you are to govern well, you must realize that my Son, Jesus, is the King of Kings, that he holds the whole history of the world in his hands. If you want to be a good president or a faithful leader, he must be your King and you must rule in his Spirit. Do not trust your own powers. Your heart is selfish and those around you walk in darkness. Your decisions are no better than those who preceded you. Trying to govern without Jesus Christ will only lead you into greater darkness. The nations do not see this selfishness of nationalism. They do not ask what their nation can do for the world. They are blind leaders who think they are enlightened. I say this clearly, “Unless you live in the light of Jesus Christ, you walk in darkness. Even worse, you will lead your nation down the road of darkness. Disturbances are everywhere. Nothing is stable. The world hurtles to a self-destruction. No one controls these events which intertwine like the elements of an explosion. Yes, the inevitable explosion. Does anyone believe that suddenly peace will descend upon the world, that arms will be put away and that treaties will last? This is the wildest of delusions. It seems impossible that peace will just come down from heaven. Yet, that is my message. I am the Queen of Peace and I hold all the elements of peace in my heart. Peace begins with forgiveness of the past, the putting aside of memories which control the present and determine the future. Look at the Middle East. Look at Africa. Look at what happened in Bosnia. Memories that go back for centuries boil over, never able to be erased, never allowing for true peace and understanding. What if tomorrow, every memory of past wars, injustices and conflicts were erased from human memory, what would happen? Mankind could begin over again. Nations could work together and earth could once again become the home for God’s children. So, I say to the nations, to people, to all societies and to you, the reader, “Erase your memories by forgiveness. Set aside those memories that only lead you to anger and violence.” I am not asking you to set aside self-defense. I am asking you to destroy the memories that lead you to violence as a means of correcting the past. Who asks you to correct the past? God will bring about your vindication. He will uphold your cause. Your task is to uphold his cause and to walk in his ways. I have not yet spoken about the great gift, which heaven will send down like the rain all over the earth. I have only spoken about what you, O reader, can do right now. Purge yourself of memories that lead to anger. I will help you.